THE PODESTA 'Esta é uma casa da cidade do século 14 com uma linda varanda com vista para pitorescas ruas medievais e campo de rolamento. Perfeito para relaxar e se sentar fora com um bom vinho italiano!Idealmente localizado no coração da Umbria, no centro histórico de Panicale, Itália. O apartamento tem seu nome derivado estando situado na mesma praça que o século 14 Palazzo del Podesta, a antiga sede dos governantes de Panicale. A restauração do apartamento foi concluído em Abril de 2002, usando artesãos locais, ferro-smiths, e pedreiros, que foi cuidadosamente restaurada com grande atenção à preservação da sua autenticidade e encanto, ao mesmo tempo que oferece todas as conveniências modernas. O Podesta 'é propriedade de Aldo & Daniela Gallo, os proprietários de muito popular Bar Gallo da Panicale. E o resto da família tem um Osteria aconchegante e encantador no principal Piazza, onde você pode ter fantásticas jantares al fresco e delicioso "comida italiana '!!! Se você vem para nós, você vai ser TRAITED como parte de nossa família !! E nós podemos propor-lhe os nossos jantares especiais para o nosso Osteria e nossa adorável Cappuccino para o nosso Bar Gallo na principal praça da Panicale. Acomodando até no máximo 3 pessoas, e aninhado contra as paredes etruscas que cercam a aldeia (datando do segundo século aC), é a momentos de distância da praça central. Todas as amenidades, incluindo supermercados, backery, bares, restaurantes, cafés, bancos com ATM, cinema, igrejas e museus estão dentro de um de dois a três minutos a pé. Térreo: hall de entrada principal, quarto duplo com casa de banho. Escada interna para: Primeiro andar: sala de estar com sofá-cama e lareira de madeira termo-/ sala de jantar / cozinha equipada com mesa e 4 cadeiras, banheiro com chuveiro. Existem: geladeira, forno elétrico, microondas, máquina de café, lote quente, máquina de lavar roupa, TV por satélite e sistema de som. Thermo lareira de madeira. WI-FI banda larga Internet. O preço inclui: Alojamento para um máximo de 3 pessoas, as despesas de electricidade, água quente, gás de cozinha, banho e roupa de cama fornecida, uso da cozinha equipada, uso da máquina de lavar, microondas, forno elétrico. Uso da banda larga Internet WI-FI. É perfeito para uma família (3 pessoas). Nossa sobrinha Katia de Panicale será sua anfitriã durante suas férias em Panicale para o nosso apartamento aconchegante e teremos prazer em ajudá-lo a partir de sua reserva até a sua partida! Estamos ansiosos para conhecê-lo aqui para a nossa bonita vila. KATIA ALDO E DANIELA. 1 lavabo enduite no piso térreo 1 casa de banho completa no primeiro andar. Este lindo apartamento está localizado no centro, a apenas dois passos da principal Piazza, com bares, restaurantes, supermercado, backery, banco com ATM e todos os serviços principais. My friend and I enjoyed our stay very much. 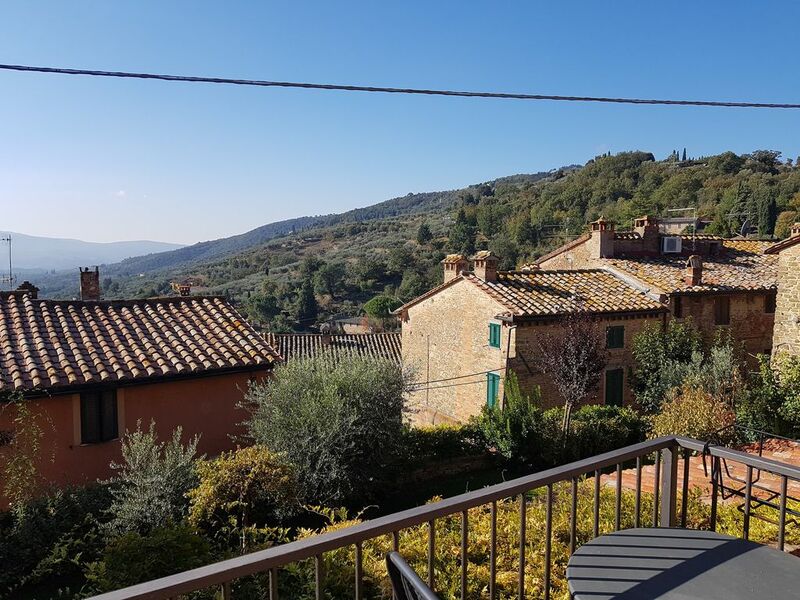 We love the quiet, local ambience of Panicale in the fall season; the light on the buildings at different times of day, and walks among the hills and olive groves. We enjoy hanging out in the cafes in the town square over coffee, hot chocolste, or wine, and good is delicious at the handful of restaurants. We got to know some of the residents, including our rental agent, Katia, who was a joy to get to know--lovely, lively, and always ready to help out. This was my second time renting here through here, and I hope to return. I reccomend Fontanara cooking school a couple of miles away; loved my pasta-making class. Il Posesta is a cozy, comfortable apartment with a pleasant light-filled living room, fireplace, well-furnished kitchen, and balcony with view. Clean. Plenty of towels and extra sheets. Large comfortable bed in downstairs bedroom. Pull-out sofa bed is not as comfortable, so recommend this apartment for a couple or couple with small child who can sleep on the sofa. I would gladly return to both town and apartment. We were first time visitors to Panicale, and it was everything that we had hoped it to be. A lovely little town, perfectly located, with all the amenities one could want or need. Il Podesto was perfect for the two of us right in the historic middle of the town. We typically had a coffee and pastry at Aldo's in the morning and then day-tripped to various sights during the day, back late afternoon for wine and cheese at Aldo's or in the apartmento. Lovely dinners at the local restaurants in the late evening put a perfect finishing touch to the day. We know that we were just tourists, but we never felt like "just tourists", included as part of the fabric of the life of the town for the short time we were privileged to be there. We absolutely loved the time we spent here and hope to be able to return one day. Katia was the perfect hostess, and we can't say enough about Aldo and Dani and how they welcomed us into their town. Il Podesta is so charming, almost as charming as the wonderful village of Panicale. The apartment is well maintained and equipped. Comfortable bed with a lovely balcony off the living room, great place for coffee or a glass of wine. This was our 5th visit to Panicale and being in the walls of the old city in such a beautiful place really makes the visit complete. A week is not enough to enjoy the town and the proximity to Tuscany and Umbrian highlights. We would definitely stay at Il Podesta again. And of course we plan to keep returning to this delightful town with its wonderful people, restaurants and shop owners. Our second stay in this sweet little apartment, Il Podesta. We stayed for 10 nights, and it was great. The small balcony is perfect for morning coffee and afternoon wine…with a view! The apartment is comfortable with everything we needed to feel at home. We are a couple in our late 50's, with a healthy sense of adventure, and this area is a wonderful place for us. Katia is always the best hostess we could ask for. We come to Panicale every year, and will return again. The village is great for a short or long stay. It has all you could want…markets, bar, trattorias, butcher…bank with ATM..Also, a perfect location for visiting the Lake Trasimeno area. Thanks again, Katia, Aldo & Daniele! We will see you all soon!! Had a marvellous week in this extremely well appointed apartment. The walled village of Panicale is steeped in history and is in a superb location in Umbria overlooking Lake Trasimeno in the distance. The town is an ideal base to explore the wider region but also the nearby villages and towns. A week was not enough as there was so much to do. Inside the town itself there is ample shopping for essentials and some great cafes and restaurants. We look forward to returning sometime soon. This was my second stay in the beautiful medieval village of Panicale and like the first, the stay was wonderful! The apartment was great and had all the comforts of home and then some: beautiful balcony, great kitchen with full size frig., microwave, coffee pot, etc. The apartment was outfitted to make the stay welcoming and memoriable. The views from the window and balcony are breathtaking. There is so much to do in Panicale and the surrounding area, big plus is train stations close by for day trips to Florence or Pisa, Rome; the wonderful valley views of the lake are ones you will never forget and the balcony allows for coffee in the morning and wine in the evening while enjoying the birds flying and the peaceful mountain view. The apartment is a great base for Italian adventures and Panicale will become part of your heart, but the biggest advantage of renting the apartment is its manager Katia! She will welcome you with open arms and to anything she can to make your trip the memory of a lifetime!